MetroPCS and Rhapsody have recently announced a partnership that offers a great deal for MetroPCS customers. For $5 per month extra on your bill, you can gain access to Rhapsody’s entire on-demand music library that consists of over 16 million songs. Ultimately, it’s a pretty awesome deal. This deal is set to be available to all customers who have a $40, $50, or $60 MetroPCS plan. For more information, you’ll find the press release below. SEATTLE—January 17, 2013— Rhapsody introduced a new mobile music offer with MetroPCS that will help millions of consumers make good on their resolutions to spend less by offering the best value for unlimited on-demand mobile music bundle anywhere. Available now, MetroPCS customers can add Rhapsody for $5 to its newly simplified $40, $50 and $60 monthly smartphone plans. Rhapsody works closely with MetroPCS to tailor its service to MetroPCS subscribers by offering customized programming and editorial content that is updated regularly, a strategy that has been elemental to the success of the offer. Rhapsody has seen significant growth in mobile with 56 percent of all listening coming from mobile phones, up from 27 percent in 2011. Rhapsody’s Irwin predicts the trend will only accelerate. The Rhapsody® digital music service (www.rhapsody.com) gives subscribers unlimited on-demand access to more than 16 million songs, whether they’re listening on a PC, laptop, Internet connected home stereo or TV, MP3 player or mobile phone. Rhapsody allows subscribers to access their music through mobile phones from Verizon Wireless, AT&T and MetroPCS, through Rhapsody applications on the Apple iPhone, iPod Touch and iPad, RIM BlackBerry, Windows and Android mobile platforms as well as through devices from Vizio, SanDisk, HP, Sonos and Philips. Rhapsody is headquartered in Seattle, with offices in Frankfurt, London, Luxemburg, New York and San Francisco. Rhapsody, and the Rhapsody logo are registered trademarks of Rhapsody International Inc. 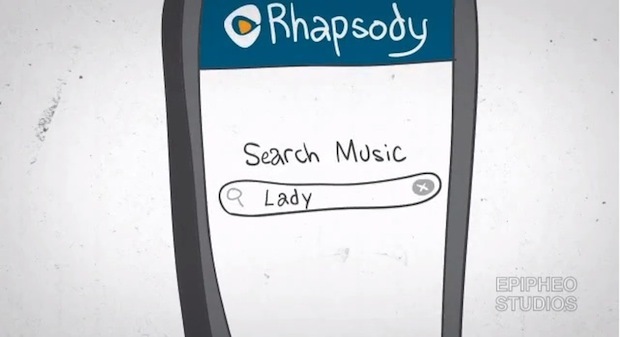 Follow @Rhapsody on Twitter and keep up with the latest on the Rhapsody Facebook page.